Product #17149 | SKU LCF32GCRBNA10662 | 0.0 (no ratings yet) Thanks for your rating! 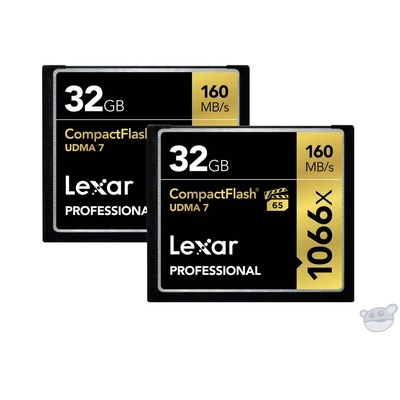 The 32GB Professional 1066x Compact Flash Memory Card (UDMA 7, 2-Pack) from Lexar features a 32GB storage capacity perfect for storing large files including high-quality photos, 1080p Full-HD, 3D, and 4K video. With a 1066x speed rating, this card is capable of achieving data read speeds of up to 160 MB/s and data write speeds of up to 155 MB/s, allowing you to transfer your files via the card-to-computer transfer method via a UDMA 7-enabled card reader (sold separately). In addition to enhanced data transfer rates, this CompactFlash card supports the Video Performance Guarantee specification. With a VPG of 65 MB/s you can rest assured this card will capture video streams at a minimum data rate of 65 MB/s for compatible host devices and recording media. You also benefit from Lexar Image Rescue Software designed to protect your data in the event the data is accidentally erased or the card becomes corrupted. The card supports the Video Performance Guarantee (VPG-65) specification. This card's been tested and guaranteed for professional video capture streams at a minimum guaranteed write speed of 65 MB/s for compatible host devices and recording media. This enables professional-quality video capture at high frame rates with no dropped frames. This card has undergone extensive testing in the Lexar Quality Labs, facilities with more than 1,100 digital devices, to ensure performance, quality, compatibility, and reliability.